Discuss with an IBM expert how to elevate your supply chain with AI and get a fast start on the journey. Take a self-guided tour of the features and benefits of this AI-enabled solution. What is the future of supply chain? Listen to Watson Supply Chain executives discuss how AI is transforming supply chains. See how Watson Supply Chain Insights uses AI and machine learning to build a smarter supply chain for your business. 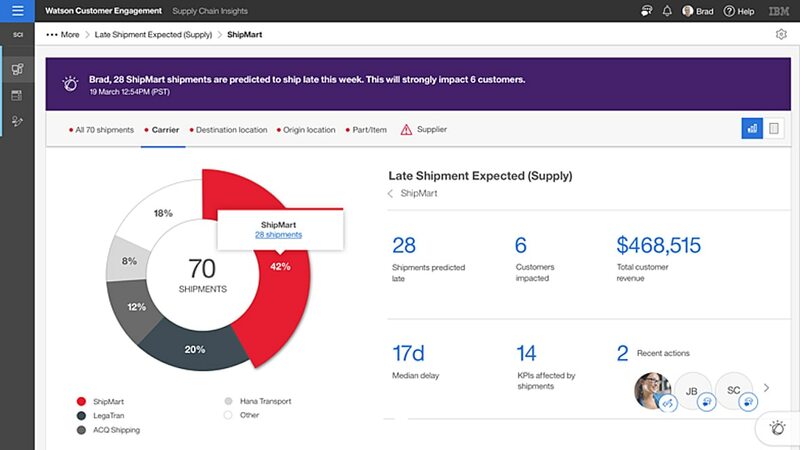 Get a quick download of the key capabilities of the Watson Supply Chain Insights solution. Learn how AI enables you to gain end-to-end visibility so you can proactively predict, assess and mitigate disruptions. Interactive account of how IBM applied AI to build a more transparent, responsive and intelligent supply chain. By 2020, 50% of businesses will incorporate AI in their supply chain. What will the journey be like for your organization?